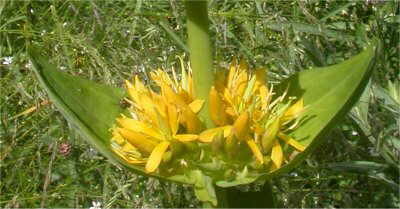 Photo of Gentiana lutea L.
Perennial plant of the gentianaceae family, up to 120 cm. 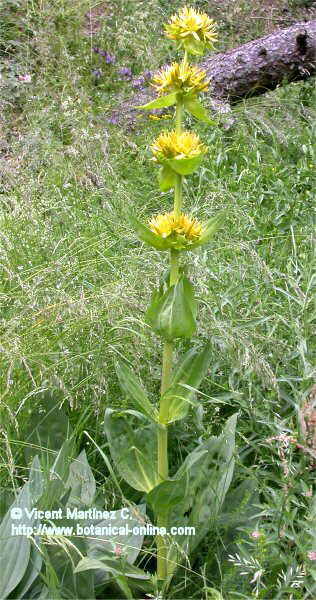 Erect stems, born from a very vigorous root, till 30 cm long, white inside and brownish outside. Inferior leaves much longer that the superior ones, green-yellow with very outstanding nerves. Superior leaves without petiole, opposed and pointed. Yellow flowers gathered in verticils. Fruits in capsule containing many seeds. Natural from the south and east of Europe, it can be found in mountains of calcareous nature starting from 1000 m. above sea level. Their name derives from Gentio, king of Iliria, the supposed region of the Adriatic where Indo-European language originated. It seems to be that this town used the plant to diminish fever.